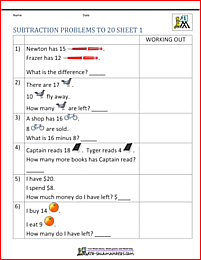 Welcome to our 1st Grade Subtraction Word Problems Worksheets. Here you will find a wide range of free printable subtraction worksheets, which will help your child practice solving a range of subtraction word problems using numbers up to 20. Each sheet consists of a series of word problems involving subtracting numbers up to 20. There is a space on each sheet for working out, using whichever method you wish your child to use. 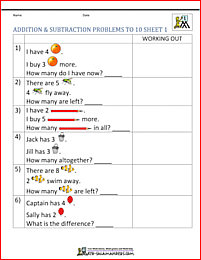 There are also UK versions of some of the worksheets which use pounds (£) instead of dollars($). subtract with numbers up to 10, 15 or 20. Take a look at our Subtraction facts to 12. On this page, your child will learn to work out basic subtraction facts up to 12. Looking for some harder worksheets? 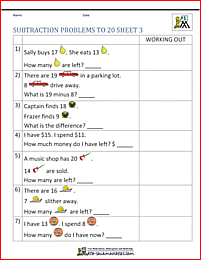 Take a look at some more of our 1st grade and 2nd grade subtraction worksheets. 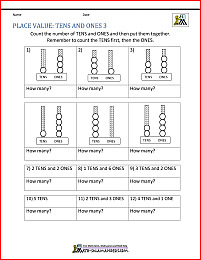 On this page, your child will learn to work out basic subtraction facts involving harder numbers. Here you will find a range of Free Printable First Grade Place Value games. 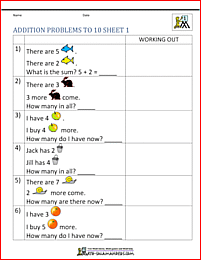 Here you will find some more of our 1st Grade Addition Worksheets. Here you will find a range of math word problems aimed at first grade level. Each problem sheet is based on an interesting theme such as parties or the seaside. All the math problem sheets in this section support Elementary math benchmarks.